The Hilltop Mobile Home Park and the Penn State Mobile Homes park are on opposite sides of town, but the scene at both is the same right now. Windows sport “For Sale” signs. Dumpsters fill over and over with pieces of trailer skirting, discarded decks, and possessions that had accumulated over the years. Heavy machinery removes — or trashes — one mobile home after another, leaving lots vacant of everything except a rectangular indentation. Both parks are closing this year — Hilltop in February and Penn State Mobile Homes in July — continuing the trend of recent years as park own- ers find they can make more money by selling the land for redevelopment than by continuing to rent lots. For mobile-home park owners, this makes financial sense. For residents, it means trying to find somewhere else to live in a town where affordable housing is limited. Some residents had planned to move before long anyway and just have to find a way to do it earlier. Others have to replace what they had hoped would be long-term homes of their own. The couple had moved here from western Pennsylvania so Osborne could study forestry at Penn State after six years of active duty in the Army and two years in the Reserves, including tours in Iraq and Korea. Stephenson had re- cently earned a bachelor’s degree in human development and family studies from Penn State Shenango and landed a job at HigherEdJobs in Innovation Park. “Here we were, two young kids who just moved in, and we were screwed over,” Stephenson says. “They could have told us it was being sold and we wouldn’t have bought our trailer.” The couple bought their trailer from its previous residents and paid rent to Hilltop for their lot. They saved money on transportation because Osborne could walk to class at Penn State. When they got the news, they frantically be- gan looking for a place to move their trailer. “We called around, and nobody had anything avail- able,” Stephenson recalls. Finally, a tip from one park owner led them to Black Hawk Village in Centre Hall, where they were able to find a lot. They moved on November 30. “Now our com- mute is 20 minutes, compared to five minutes, but you’ve got to do what you’ve got to do,” Stephenson says. 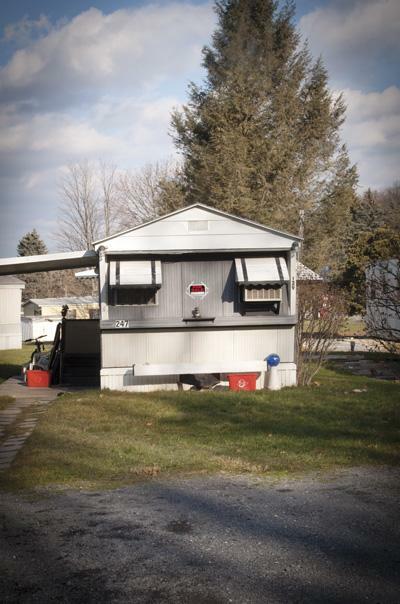 Stephenson and Osborne represent one of an estimated 200 families that lived at the two mobile-home parks when word arrived that Hilltop and Penn State Homes would be closing, according to Natalie Corman, director of the Centre County Office of Adult Services. Her office is working with many of the residents to connect them with other human-services agencies that can help with housing, childcare, transportation, and other needs. Among the agencies are Housing Transitions Inc., Interfaith Human Services, and Community Help Centre. Former Hilltop tenants Michelle Corey and Jesse Kennedy are among the new Philipsburg residents. Thanks to a US Department of Agri- culture loan, they were able to buy a house even though they had no money for a down payment. Their new house cost less than $100,000 — a listing price hard to find in State College. “If we’d had time, we could have waited for something closer that would have been better for us. It’s rough to force this kind of thing on a person so fast,” says Corey, who works in marketing at Sam’s Club on the Benner Pike. Kennedy is an electrician but took a job at Hogs Galore in Philipsburg when they learned they’d be moving there. Corey had bought their mobile home in Hilltop about five years ago and paid $460 a month to rent the lot. Although a “For Sale” sign was in the trailer window in December, the only of- fer has been a “lowball” one from a construction company. If they don’t find a buyer, she says, they’ll have to pay Hilltop $750 to take care of demolishing or removing the trailer. During Labor Day weekend, when Hilltop residents learned that the park would be closing, Corey began knocking on her neighbors’ doors and organized a tenants’ association with the hope of banding together to purchase the park themselves. As of early December, the group had begun working with PathStone Corp., a nonprofit group that helps tenants find financing in situations like this. However, Trinitas Ventures of Indiana had already petitioned College Town- ship to rezone the property to higher-density residential, indicating that redevelopment is in the works. Current Hilltop owners Sharon and Ken- neth Mayes did not return phone calls concerning the park’s status. Although Corey remains passionate about the possibility of the tenants purchasing Hilltop, she says she and Kennedy couldn’t risk waiting until February and having no place to live, so they joined the “exodus” to Philipsburg. Corey owns her trailer outright. Some residents used loans to buy their mobile homes and still owe on them. If they can’t find buyers and can’t move the trailers to new lots — because they can’t afford to move them, or they’re too dilapidated to survive moves, or they can’t find places to move them — they may end up mak- ing payments on loans for homes they no longer live in. That’s a possibility for Barbara Burris, who bought her Penn State Homes trailer from the previous residents in July 2011. For Burris, a mobile home had been the best option in State College, even with a home loan and $330 a month to rent the lot. “I had looked at apartments, and there was nothing I could af- ford,” she says. Plus, the trailer had the added benefit of a yard for her daughter, Vivienne Witmer, now 2, to play in. For now, Burris is staying put as long as she can, since she still has to pay on her mobile-home loan. She’s had only one offer to buy the trailer — for $1,000 from a man who buys and resells mobile homes. The trailer park land has been purchased by 1752 North Atherton Street Associates. The site is zoned general commercial and medium-density residential. In September, partner Heidi Nicholas said redevelopment plans had not yet been defined; she did not return calls for this article. Harry Houts is among those who still don’t know where they’ll live once the Penn State Homes park closes in July. A retired certified public accountant, he has lived in his trailer since Groundhog Day 1975, almost four decades ago, when the Temple Drive-in theater was still across Atherton Street, where Walmart now sits. He doesn’t think his trailer is in good enough shape to move it. Born in Lemont and a nephew of department- store founder O.W. Houts, he has lived in the area all his life, except for a dozen years in Kingsport, Tennessee. He’ll be moving, but he says, “I don’t know where or when.” A friend in Tennessee has offered him a place to stay, but he also has written a letter to his son in Virginia, asking if he could move in with him. So far, Houts has declined assistance from the agencies that have contacted him offering to help him find a new place to live. Joy Habovick says the short lead time — learning in September that she’d have to move from Hilltop by February — left her with one less-than-ideal option: At age 43, she moved back in with her parents. Habovick lived at Hilltop for 12 years, ever since her son, Anthony Pastrana, was born. She owned her trailer, but moving it to her parent’s property in Howard would have cost more than she could afford because she would have had to drill a new well and install a septic system. “I sold my trailer for considerably less than it’s worth,” she says. Since her move in December, she’s been com- muting to work in downtown State College, where she is an assistant teacher at St. Paul’s Christian Preschool; she also works part-time at Penn State doing event parking. Pastrana has Asperger’s syndrome, a form of autism, and attends the alterna- tive STRIDES program at Fairmount School. He is continuing school there, although now he has a half-hour ride to school in a school-district van. Habovick says she would have loved to stay in State College, but “you can’t rent anything under $700 a month.” She figures it will take her about two years of living with her parents to set aside some money and improve her credit rating so she will be able to get a loan and buy another home. The Hockenberrys own a couple of acres in Mifflin County and paid $1,400 to move the trailer there. After they’re settled in, they plan to invite the former owner for dinner so she can see what they’ve done with the home she lived in for 20 years. As the February move-out deadline for Hilltop residents approaches and the July deadline for Penn State Homes looms on the horizon, Corman’s office continues to seek out residents of both parks who need help finding their next homes. “We’ll continue until we’ve met with all the residents remaining there or until the parks close,” she says. Then, she predicts, another wave of families will need help — those who moved onto friends’ couches or wherever they could temporarily, simply because they had no choice. Tracey M. Dooms is a freelance writer in State College and a contributor to Town&Gown.